Selecting the right wedding catering services to serve food that matches your winter theme can really help bring everything together. Here are some of the most common wedding food/menu ideas for those who decide to have a wedding in the winter. An important part of any wedding is the reception. 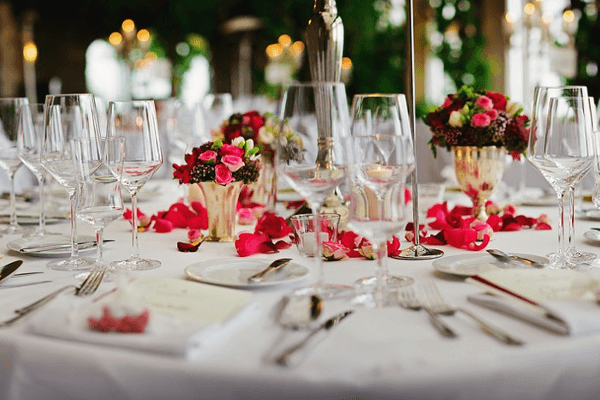 It is important to find a caterers that can provide a winter wedding reception menu with a buffet including entrees, starters, appetizers, main courses, and other reception ideas. There should be some caterers out there that have specifically set up menus for different themes, so finding one that did a winter theme shouldn’t be too difficult. However, make sure that you are not overdoing it on the theme. Putting in a couple decorations and menu items that don’t go with the theme can help create a great contrast if done correctly. Another idea to follow would be to have cold appetizers for your wedding cocktail hour. This will help you stick with the wintery theme. However, you may want to make sure that some of your wedding food and beverages are warm so that your guests don’t get too chilly. Make sure that you have a caterer that can work with you to make your wishes come true and give you some good ideas for incorporating your theme while also keeping guests happy with a variety of options. Fewer things put people in the winter spirit quite like hot chocolate. Ask your wedding reception caterer if they can help you put together a section for hot chocolate with a toppings bar so that everyone can warm up and customize one of these favorite winter drinks. Other wintery drinks can include mulled wine, apple cider, tea, and coffee. Make sure to have a selection so that there is something to please everyone at the reception. Weddings are a great time for guests to mingle and socialize, and having bite sized canapes allows them to nibble on delicious foods without being stuck sitting at a table. Consider the variety of mini-sized options available to allow guests to enjoy plenty of great food in small portions. The final piece of advice for event catering in your winter weather theme is to think about the desserts. A chocolate fountain would help with the theme, and there are so many chocolate items to think of such as chocolate lava cakes, fudge, brownies and more. Rich, comforting desserts are perfect for providing a cozy food finale for a winter wedding. You want your wedding day to go off without a hitch, and sometimes that is easier said than done. There are a lot of great wedding reception food ideas that your caterer should be able to follow if you show them what you want. With these catering ideas, along with the help of a professional caterer, it will be much easier to pull off your winter weather theme and get everyone in the spirit while they celebrate your nuptials.